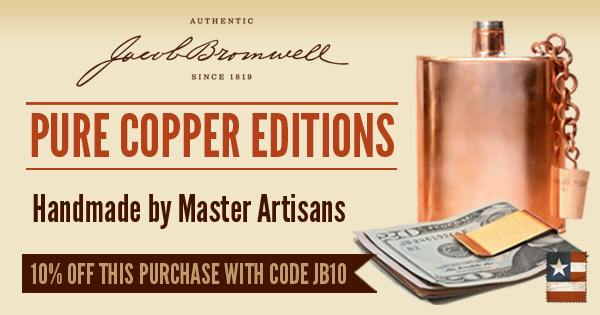 GREAT 10% off Jacob Bromwell coupon code! I don’t know if you’ve seen the collection of Jacob Bromwell products, but that’s home to the Great American Flask – copper flasks and cups, and now they have a whole bunch of “Limited Editions” and New Arrivals section too! This store is amazing, and definitely fits into the “Cool Stuff” category! And, not just because of the Flasks and truly American Heritage items (e.g. old fashioned popcorn poppers, chestnut roasters, old fashioned flour sifters, etc) – but also because everything is Made in the USA, and you get free shipping if you order $250 or more! AND the products are guaranteed for life! This also fits into the category of “what type of gift to buy for the person who has everything else.” Well, do they have a copper measuring cup or copper FLOUR SIFTER? How about a stove top potato baker? Hmmm? I didn’t think so! But they can now! They have cool old-fashioned cookware, copper spice jar, and of course their famous copper ware – like the Great American Flask, Jack’s Moscow Mule Cup (also copper), money clip, shot glasses – I mean, this is just a really neat site! So use the coupon code and save a nice 10% off!